Three weeks ago I set out to film an exploratory fly fishing trip to the Socotra archipelago with Edward Truter who was representing Tourette Fishing. There was a huge amount of excitement among us fly fishing bums as Socotra has proved to be an incredible destination for jigging and popping for GT’s and other species with proof coming from the trips Wild Sea Expedition has done there. The average size and number of GT’s is simply astounding and it is certainly a prime spot for this kind of fishing. Owing to the structure and location of the islands the average size and quality of fish species is incredible. As far as the fly fishing exploratory goes the process was difficult as we had to do a lot of scouting in places that no one had fished before and with very little information to fall back on. That process involved hours of walking up and down long beaches and other sections of coastline looking for fish with very little food and water in intense heat so most days we had it rough and the fact that we had to camp out made things harder in terms of logistics (keeping equipment clean, charging batteries etc.). The sight fishing proved very difficult as the water off the beaches is deep which makes spotting fish hard. In the first half of the trip Leonard Flemming was fishing with us and both Ed and Leonard managed to get six nice bonefish between the two of them but it certainly wasn’t easy. 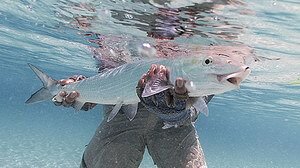 The quality of the bonefish was impressive with the fish being very fat for their length. Some really big bones were seen but unfortunately Ed and Leonard were not able to get the fish to convert. The majority of fish caught were Wave Garrick (Pompano) and Salad Fish (Doublespotted queenfish) with a few odd and varied species in between and we certainly got some very interesting species on fly. Going offshore we had a few opportunities to cast at Milkfish but none of the fish took an iota of interest in any of the various creative flies thrown at them. Teasing sessions offshore (and inshore) also yielded basically nothing. One thing we didn’t do that we could have done was to do teasing for Sailfish as the waters around Socotra have incredible numbers of Sailfish and some very big ones to boot. What really perplexed us was the sheer lack of gamefish we saw inshore as the amount of baitfish and other life was incredible in some places and some spots just looked too good not to have fish. We only saw a few GT’s cruising along the beaches but nothing of spectacular size. There were quite a few bluefin and other trevally species around but not many were caught. On the last day Ed and I walked up Ray Montoya’s beach in absolutely perfect tidal and weather conditions and we saw very little with no bonefish or any other notable fish being seen. Having said that exploratory trips generally lead to many more questions than answers so who knows. Perhaps a different time of year, different conditions etc. It certainly was an amazing experience for me as this place is so strange and beautiful. Ed is a real character and working with him was a great experience and I’m confident we will produce a great film outlining this exploratory trip. Many thanks to Wild Sea Expedition, Tourette Fishing, Edward Truter, Patagonia, LOOP, Global Rescue and Hugyfot for making this exploratory trip possible.